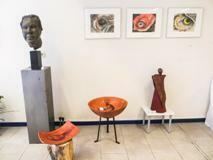 Kops and KS exhibit together in the Gallery at the Keizerstraat 149. Artworks are also displayed in shop windows, at the YMCA and the RABObank on the Keizerstraat. In the gallery 30 works of art from several disciplines cover the landing of the Prince, the House of Orange, culture of Scheveningen and the sea. The exhibit ‘ 200 jaar koninkrijk op Scheveningen ” is open Saturday November 9th through November 30th from 13:00 till 17:00. Closed on Mondays. KopS uses the ‘landing in 2013’ as an opportunity to promote Art Scheveningen in the Keizerstraat. The route from the sea to Plein 1813 passes through the Keizerstraat, which now is splendidly connected to the sea through the new boulevard. The exhibition is advertised via flyers and posters. For more information, please contact: kunstopscheveningen@gmail.com / www.kunstopscheveningen.nl.